Source: cikrf.ruFor the first time ever, it seems Russian society is consolidating ahead of presidential elections not out of desire for victory, but because none of the alternative candidates have a chance at winning — and thus, no chance for real change. In conditions of deep political apathy, when people say to one another “this is going to last for another six years” and there’s no chance to stop “this”, more and more active citizens in Russia find comfort arguing about how not to vote, rather than who to vote for. The idea of boycotting the elections isn’t new. It has always made me feel awkward — just like anything that’s overly emotional or unrealistic. 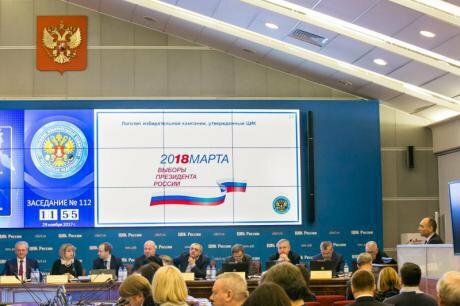 But in light of the effective campaign carried out by Alexey Navalny, and the Central Election Commission’s refusal to register him as a candidate, the opposition politician’s old call to action began to look different. The rather widespread support for the boycott from an increasingly large circle of activists, politicians and political analysts was unexpected. In terms of its effectiveness, a boycott is a desperate measure. But elections in Russia are a rare time when opposition-minded citizens can state their position loudly — and not only on the street. A political boycott supposes a broad coalition made up of very different social groups (perhaps we’re witnessing the creation of it right now). On one side of the barricades, there’s the forces who unite around Navalny’s call (and not necessarily around Navalny himself). And on the other side, there’s the party of power, as well as the liberal party Yabloko and Ksenia Sobchak, who have joined it. Sobchak has already made her message to supporters of Navalny clear: when your leader isn’t registered for the elections, I will represent your interests (i.e. vote for me). Yabloko’s position is even simpler: boycotting the elections (i.e. not voting for Grigory Yavlinsky, the party’s leader) is a criminally negligent choice to stay at home. After all, you won’t get any changes like this (I note that this party, which is calling on people to vote this March, is led by a man who plans to lose the presidential elections for the fourth time in a row). 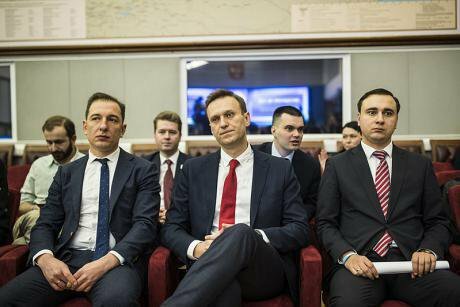 Alexei Navalny, Russian opposition leader, at Central Election Commission's session which is about to deny his right to be in the ballot on the upcoming presidential elections. Photo CC BY-SA 4.0: Evgeny Feldman / Wiki Commons. Some rights reserved.We can see an attempt at clouding the meaning of a boycott in Yabloko’s position. After all, a boycott is an active position — especially in contrast to not voting (which does, in fact, mean sitting at home on the couch). Indeed, Navalny calls for an active boycott (“Don’t vote! Agitate against it! Be an election observer!”). And I get the feeling that, given the hopeless nature of the coming elections, Yabloko take no less joy in Navalny’s non-registration than the party of power (if United Russia does actually feel something apart from indifference). For Yavlinsky, supporting the voters’ strike means supporting Navalny, as well as reducing the turnout from Russia’s protest electorate — a prospect that Yabloko can’t reconcile itself with. And here, of course, there’s moral questions for my colleagues from the united democratic camp of Yabloko/Sobchak to answer. On paper, they demand an end to Putinism, but in practice they not only fail to show solidarity with the strongest anti-Putin candidate who hasn’t been permitted to participate in the elections (Navalny), but are even happy about it. Which, on the one hand, you can understand (less rivals means less competition), but this will not lead towards the stated goal (an end to Russia’s authoritarian regime). In this situation, the most ethical decision (and therefore most pragmatic, according to Andrey Sakharov) for Ksenia Sobchak or Grigory Yavlinsky would be to withdraw their candidacies in protest against the non-registration of Navalny and these elections without choice. Unfortunately, we all know that this is impossible. Mass protest and an electoral strike will become Russian citizens’ only response to these hopeless elections.